The trees and shrubs all over Montgomery County in Spring, The Woodlands, Conroe and up into Willis are more than part of our beautiful landscape. Our trees provide shade and energy efficiency, privacy, environmental benefits, and a plethora of fond memories for tree planting homeowners. Sometimes trees die or decline in health unexpectedly-it is easy for the untrained eye to miss subtle initial signs of tree or shrub disease and stress. Unfortunately, weather conditions like floods, high winds, droughts, and lightening can also negatively impact the health of our trees. To make matters more complicated, HOA and POA tree and removal guidelines for permits and applications can seem like an added challenge. It's okay, we get it. Rothco Tree Service is here to help you with professional and affordable tree removal services. We promise you "Tree Service You Can Trust" so your landscape stays healthy, looking great, and gets back to giving you the best blooms on the block! Our job is to provide our clients with knowledgeable and responsible tree healthcare recommendations. This includes letting you know when a tree needs to come down or when and if a diseased tree can be saved. It also includes debris removal and haul away with every job- because no one should be left having to clean up trees and branches after hiring a tree service. Pricing varies from tree to tree. 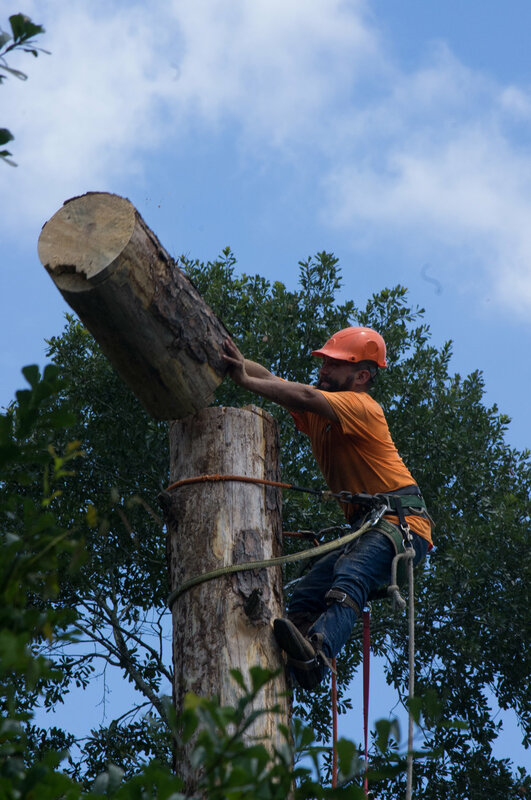 Factors that affect pricing include height and diameter of the tree, condition of the tree, yard size, surrounding foliage, and existence of power lines or other structures that may cause a bit more caution, time, and/or care from our crew. Sometimes pictures may be sent in for our estimators to give rough estimates on, but we always recommend taking advantage of a free in-person estimate. By doing this, we can assess client goals and capture as much history as we can from the owner's perspective to determine disease processes and problems. If a tree is deemed unhealthy and in need of removal, our tree removers will find the best methods of taking the tree down. These hazardous trees may have rot or decay or areas of concern for our tree climbers and removers and surrounding structures - it isn't always the safest practice to just "drop a tree." Rothco Tree Service is licensed, bonded and insured for your protection. Our crew is trained well trained and operates to the highest of industry standards set forth by TCIA. Even so, accidents can happen. While we have never needed to use our insurance policies we are always ready and prepared for any unforeseen circumstances that may arise. Have Pine Bark Beetles in Your Pine Tree? Stressed pine trees may be attacked by pine bark beetles (usually one or more of the three species of engraver beetles). These insects fly to a weakened or stressed pine tree and attack by boring through the bark. They feed and lay their eggs between the bark and the wood. Once the needles on a pine tree turn red, the tree is dead, and there is nothing that can be done to save it. Hardwood or broadleaved trees such as oaks, maples, hickories, etc., will not be attacked by pine bark beetles, but pines account for such a large part of our native landscape that beetles should be taken of care with urgency. Unsure if you have pine bark beetles? Call us for a FREE estimate, or send us an email with a photo of what you're seeing. Can I Transplant My Tree? Not all trees are recommended for transplanting. Generally speaking, the smaller the tree the more likely it is that it may be moved. Sometime we may recommend a different species all together for replacement depending on the property and environmental conditions. We are always honest and try to give the best feedback possible in these cases. What can I do with the tree removal debris (limbs, logs, and branches) after the removal? Normally we will include greenwaste haul away and/or tree debris removal with all of our estimates. That is because the majority of our clients do not live in residential areas that allow for burning. Pricing to cut and stack wood can vary depending on the tree work being done, the scope of the project, and the amount of cut wood requested. If you are debating keeping your debris for Montgomery County greenwaste to pick up, we suggest you visit their website and view their collection guidelines. For those who have lost a tree with more sentimental value, Pinterest also has a long list of great DIY and home projects using twigs, branches, old stumps, and wood slices you can try out. Use the form below to contact us regarding your tree needs. We will contact you shortly after to set up a time for our estimator, Justin, to visit with you or drive by the property and assess the tree work. Occasionally we are able to give estimates from photo submissions via email- if interested, please inquire if this option is appropriate for the type of tree service you are requesting. You may also email or call us to make an appointment.